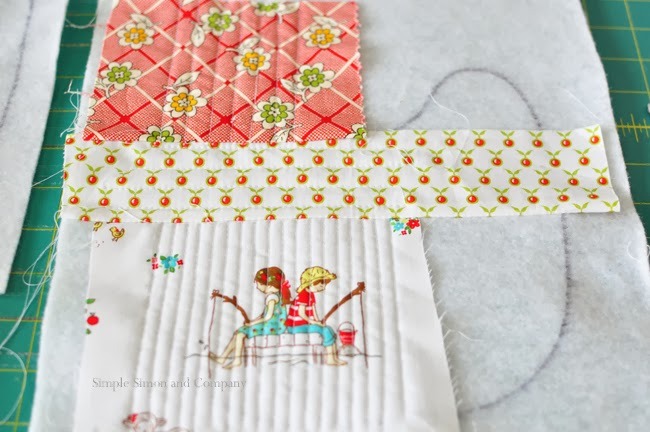 I am kind of addicted to the quilt-as-you-go method. 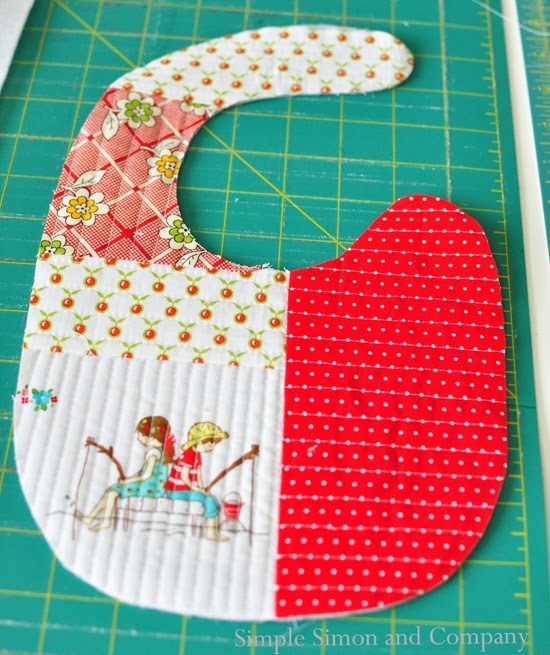 Thanks to whoever was the genius who figured it out….and thanks to all those who have posted tutorials on this simple quilting technique! 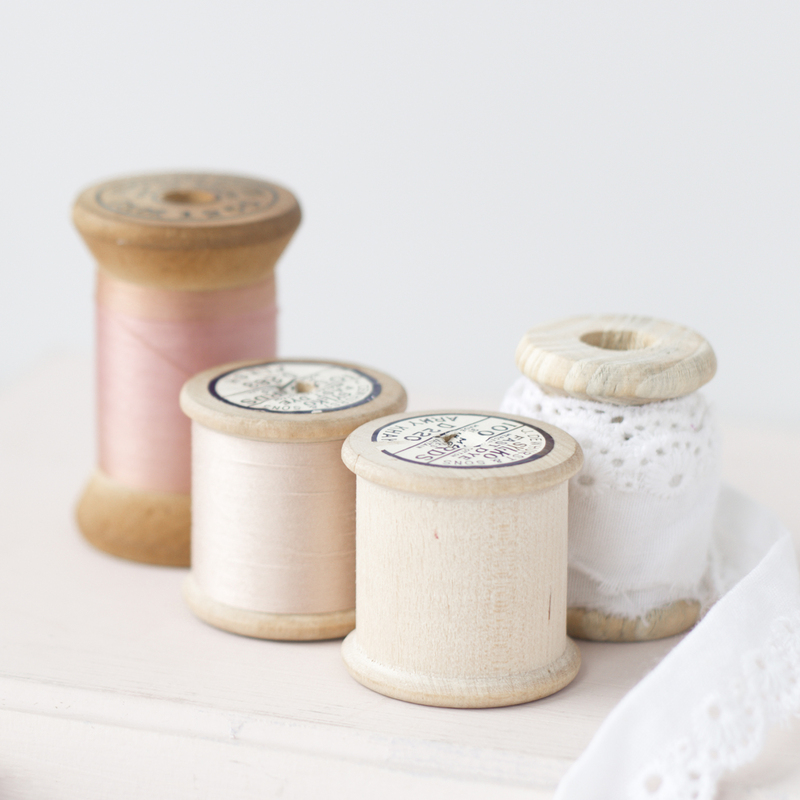 It’s fast and easy and GREAT for little projects. But, bibs are fun! And easy! And are a great gift! And they use up scraps!! Step 1: I traced the bib pattern onto the batting. Step 2: I laid out my scraps to fit over the general bib shape. 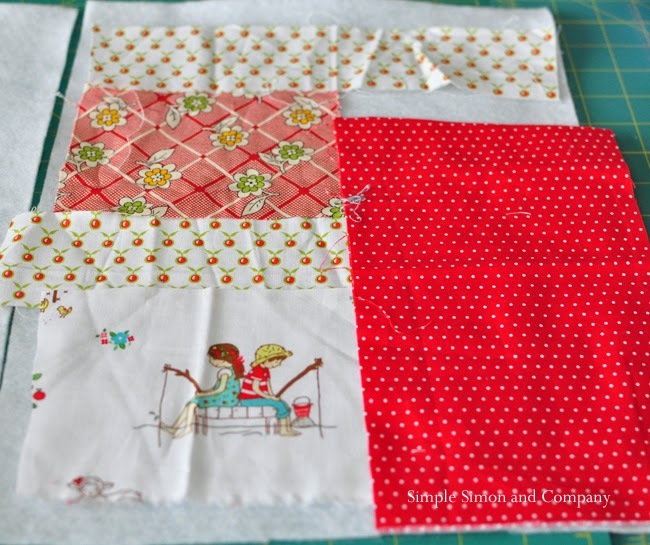 Step 3: I started with my fussy cut square and quilted that one first. 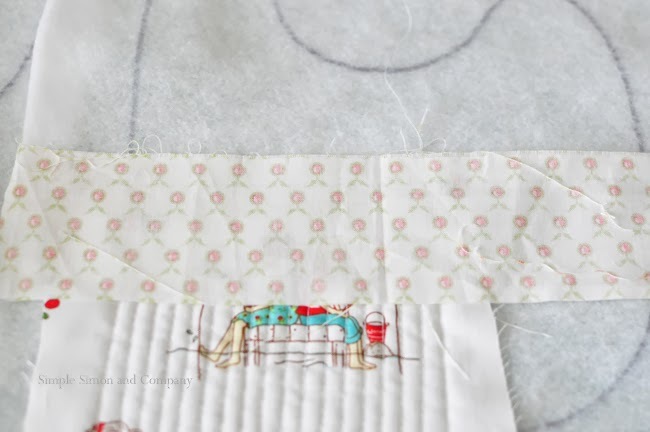 This is what it looked like after I quilted it…..I did 1/4 inch lines on this piece and alternated 1/2 inch and 1/4 inch lines on each piece in the bib. I then added the next piece. Until I had the whole bib done. At that point, I cut it out. Then I just put the bib backing on top (with right sides together) and sewed around both of them. 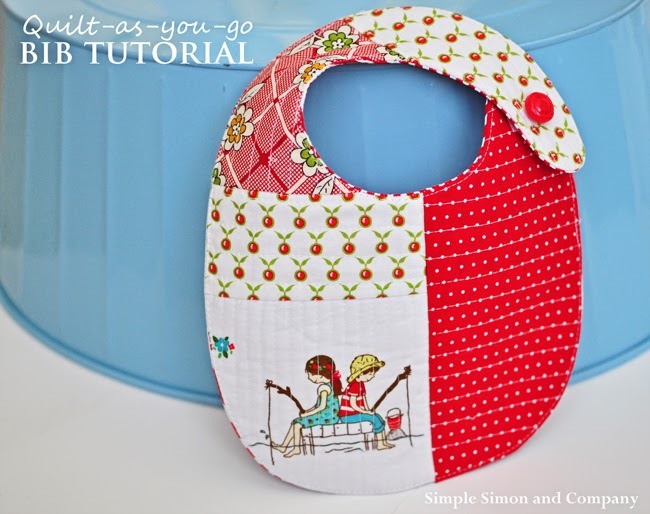 Turn and flip and top-stitched around like you would another bib pattern. I used Velcro to close the bibs with a decorative button on top (but I always freak out and tell people to cut off the buttons if babies aren’t supervised while wearing them–when we sold them we didn’t put buttons on any bibs). And you are done! Oh, I can’t tell you how glad I am that it is Friday. And I have some time to work on my house……whew….it’s been quite the couple of weeks. I love these…. they are darling! My kids aren’t much on bibs but I’m wishing they were! This would be great for baby showers!!! Love it. Pinning for future reference. This is so cute! I’ll have to try it! Thanks so much for sharing this. We have a new grandbaby coming in January. I may have to give this one a try! Thanks ladies, I am on a serious scrap-busting mission….I need to down-size the scrap bins! 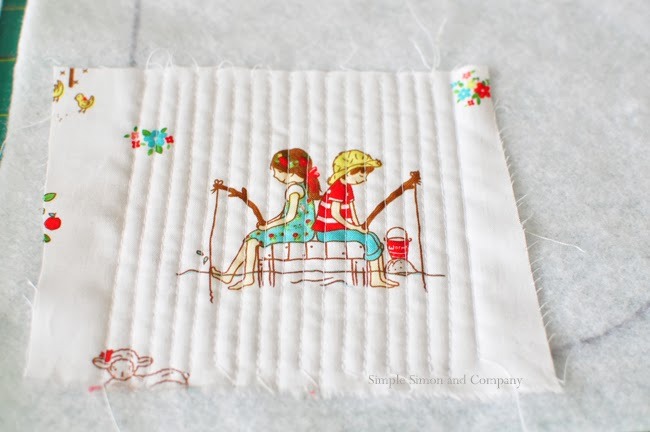 The fabric of the two kids fishing is adorable. Where did you get it? This is darling, I love the vintage prints! The pieces look as though they are sewn together or else the material would fray?? 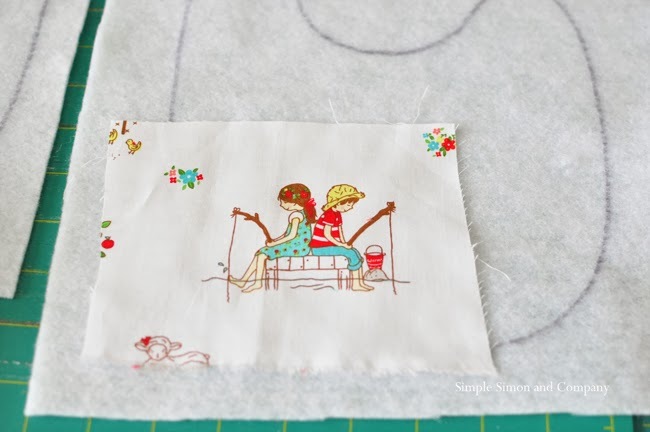 How/ when do you sew them together, or do you fold over? I have the same question. 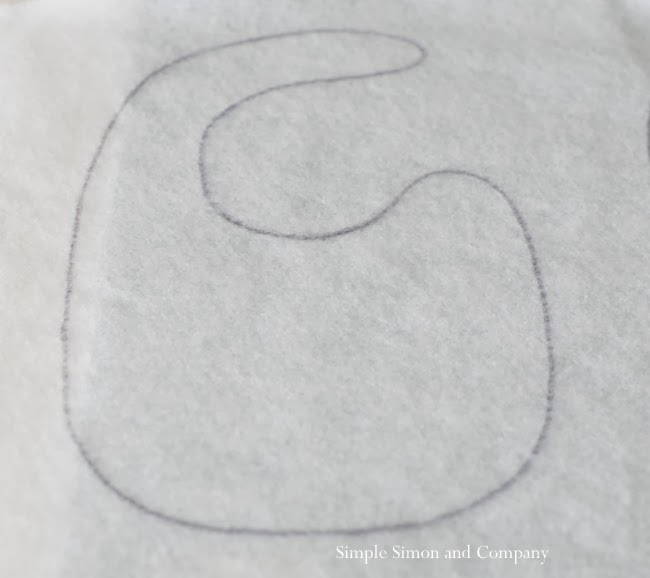 Just wondering if the Simple Simons’ used a lockstitch by placing the stitch length at zero and using some pressure, three dives into fabric and then re-setting stitch length to normal and sewing on or perhaps they had the lockstitch feature on their machines. 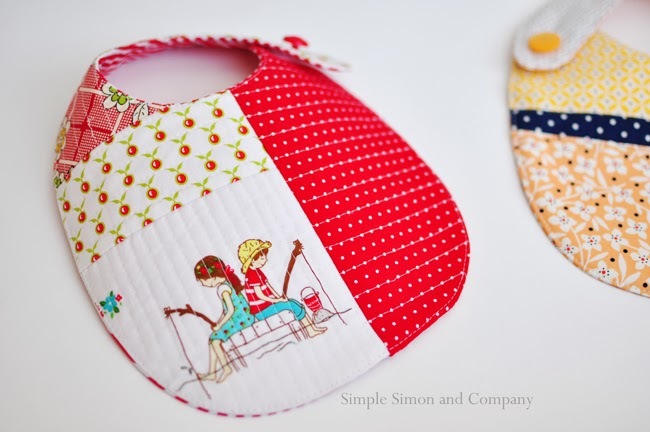 These are perhaps the lovliest sewing of baby bibs on the Internet! Thank you so much for letting us in on your secret. You are both so talented. I am working on one at this minute! If you could off some insite we would appreciate.